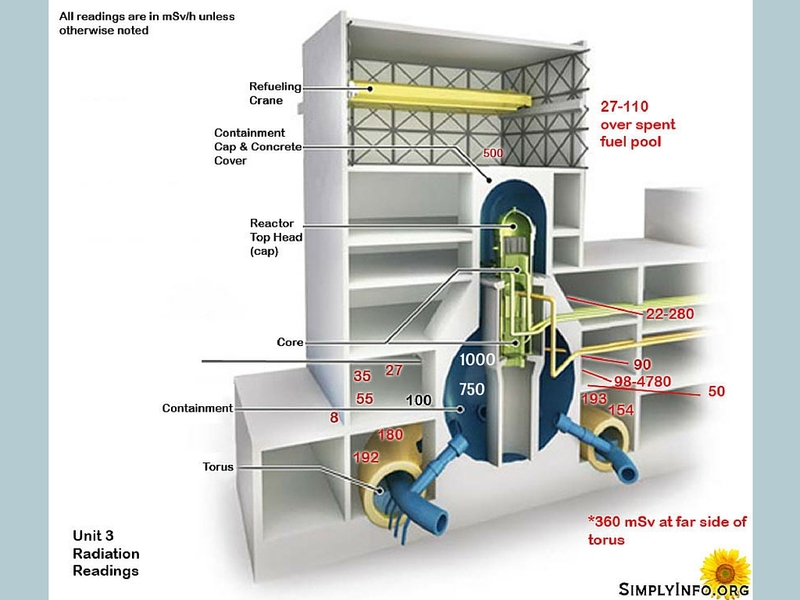 Historical information and statistics about Fukushima Daiichi Reactor 3. The third of the Fukushima Daiichi reactors to be built, reactor 3 had the shroud replaced in 1999. At the same time Fukushima Daiichi received it’s first shipment of MOX (plutonium-uranium) fuel. Various issues and the rescinding of local government approval to run MOX in unit 3 delayed the installation of MOX fuel until September of 2010. At the time of the earthquake unit 3 had a mixed load of MOX and LEU in the reactor. It is unclear how many total MOX shipments were received at Daiichi and how many total assemblies are stored or in use at the power plant. Records show unit 3 to be the only one running MOX but MOX fuel must be stored in a spent fuel pool even if it is unused due to volatility. Updated records show one shipment of MOX to Kashiwazaki Kariwa that was not used at that plant due to a local referendum voting down the use. The MOX assemblies were accounted for at Kashiwazaki Kariwa up until a few years ago when no further updates on the status of those assemblies was made. This leaves open the potential for those assemblies to have possibly been planned by TEPCO to be moved to Fukushima Daiichi for use there. We do not have any documents to prove or disprove this theory or any record of the current location of those MOX assemblies initially delivered to Kashiwazaki Kariwa. Unit 3 lost all AC power at 3:42pm JST on March 11th. Loss of the emergency core cooling function of the ECCS was reported to authorities at 5:58am JST on March 13th. At 9:20am JST on March 13th the pressure relief valve for the reactor was opened. At 1:12pm JST on March 13th sea water was injected into the reactor. Pressure in the reactor reached 460 kPa beyond the design value at 6:10am JST March 14th. Unit 3 suffered an intense hydrogen explosion at 11:01am on March 14th. At 8:32am JST an enormous amount of white smoke belched from unit 3. Self Defense Forces attempted to drop water by helicopter at 4pm JST on March 16th but was abandoned due to high radiation levels. At 9:48am JST Self Defense Forces resumed helicopter water drops. It is now estimated that the reactor core melted to the bottom of the reactor vessel within 16 hours of the station black out (power loss). The melted core is also likely melted through the vessel and is somewhere within the containment structure. 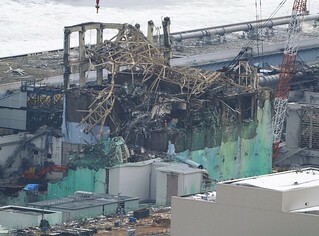 TEPCO has not been able to send in workers to perform any sort of containment inspection. Workers entered the basement level of the building and attempted to open the torus room door. The door was found to be bowed out and jammed. In July 2012 workers were able to put the robot SurveyRunner into the torus room where it did a partial inspection of the catwalk on top of the torus. Video of that can be found here. Unit 3’s torus room was found to be in much better condition than imagined and in much better condition than Unit 1’s torus room. The 1st floor TIPS room of Unit 3 was also inspected in May 2012. The steel door and door frame had been blown into the TIPS room hallway. This prevented any additional inspection of the TIPS room itself. Current work in late 2012 consists of attempts to remove debris from the refueling floor level with robotic heavy machinery. A steel frame and cover will be installed over the remaining building to facilitate removing fuel from the fuel pool. The containment air lock doors have been found to be leaking high levels of radioactive water in small amounts. The heavy concrete plug for the equipment hatch was pushed out of place raising more concerns of what took place in containment. Some of the interior building damage is likely due to the massive hydrogen & steam explosions at unit 3.